I am climbing a broken ladder, the hook and ladder kind found on a firetruck. It swings precariously from a second story doorway as I try to reach home. Each of my hands clutch something in their fist leaving me unable to hold on for safety, a tenuous mid-air balancing act as I try to keep from falling off. Below me, rising up from the ground, is the bottom half of the ladder that has disconnected from the top. A disoriented drunk man is trying to climb up. All I know is I want to get away from him. Longing for the attention of a father lost in a dry martini with a twist is where the ladder first broke. With no safe ground beneath me, my heart clutched to fear, tenuously stuck between wanting to get home and wanting to run away. My innermost heart shaped itself from this first broken heart. Attracting deeply wounded men that I could not count on was a mirror of the broken ladder of my own heart. The dream of this broken ladder is the longing for its repair. It cries out through personal dreamtime. It is intimately linked to a collective slumber so a bridge may be built between masculine and feminine. Healing our personal wounds is what shifts the collective. The desire for my heart to entwine in unity is the desire of the heart of humanity. Healing the collective starts by holding my heart with deep honor and respect. The feminine longs for relationship. Her healing comes through connection. The gaze of the wounded masculine avoids the glare of the wounded feminine with her need to be loved. With a chasm as wide as any canyon how can a bridge ever be crossed? As I dive below the waters in which I am held I call forth from my heart a Spirit ally. One who will guide me underwater to the healing of my heart. A jellyfish appears. Its tentacles wrap themselves around my heart. The charge of electrical impulses surge through me like a defibrillator shocking a heart in cardiac arrest. An electric current is restoring flow where my heart has lost life force. Currents of trust flow through my heart. More shocks come through pulsing in love. Other waves recharge my heart with gratitude. Masculine and feminine timidly turn towards each other in a long awaited reunion. The impassible bridge has been crossed on waves of trust, love and gratitude. A prayer of tears wash me clean with compassion for my most tender heart. An unexpected ally from the world of Spirit. 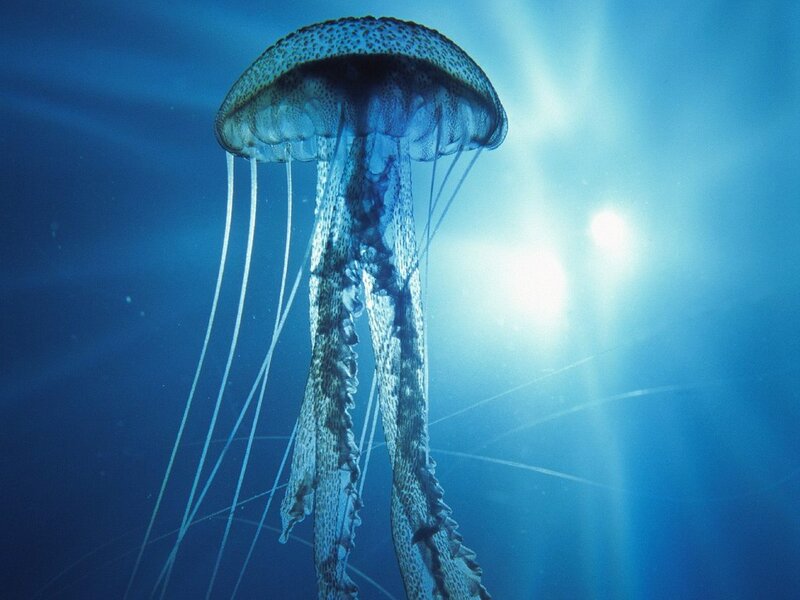 I confess I am not usually fond of swimming with jellyfish. On retreat in Bimini jellyfish filled the underwater alcoves we explored. I was struck, for the first time, by the beauty of their transparency in a nearly invisible form. Their utter abandon to flow and fluidity. The jellyfish of all things knows how to repair this broken ladder. It appears as a teacher of the pure of heart. The purest of heart does not cling to hurts or betrayals. The purest of heart flows on the waves of trust. This ally of Spirit knows how to cross an insurmountable bridge to wholeness. Transforming the broken and lifeless space in my heart to one of union and love with a direct infusion from the lifeline of Spirit. A healing that reaches through time. Restoring a bridge to a lineage of male ancestors no longer connected through our brokenness. A vision for the future no longer created by dragging around the weight of a broken heart. At any moment the shifting tides of life unveil what is ready to be healed so we may rise to the majesty of who we were born to be. It may float through in dreams. It may reflect in the mirror of your beloved. Its roots may lie in the family of origin. Whatever the source we can choose to look away or look within. Let the tides of life wash clean your heart. May you travel to new shores on the waves of trust, the waves of love, the waves of gratitude in a co-creative dance with the world of Spirit who deeply longs to dance with us. I share with you these dance steps for they are not my own. They are for every heart to remember who we are. So we may wake from the collective slumber. Dream a new dance of the sacred union of male and female into being. One that begins with a heart beating in trust. A heart beating in gratitude. A heart beating in love. A despacho is built to hold our visions. to hear the whispers of our Soul. Feathers surround, above and below. 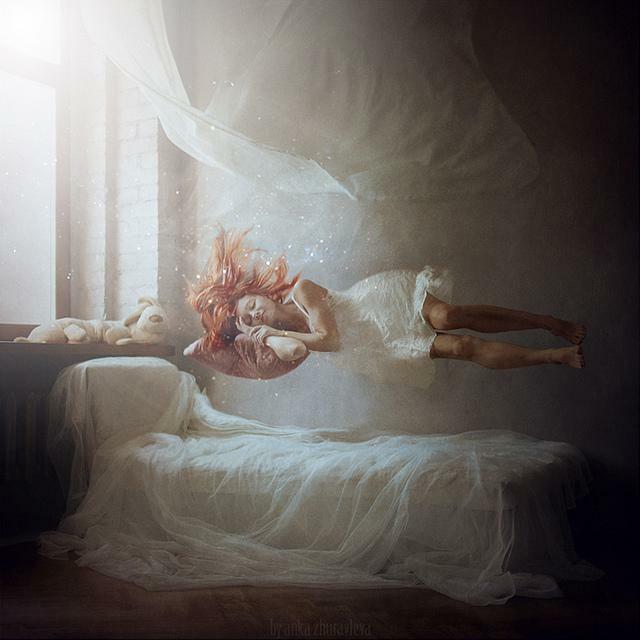 Gifts from Spirit so our dreams may take flight. Eight qintus are called and held in the heart. The shape that it makes is that of Infinity. Eight balances Spiritual and Material. A starfish manifests our visions in form. As above in the heavens, so below here on Earth. Offerings feed our prayers and intention. 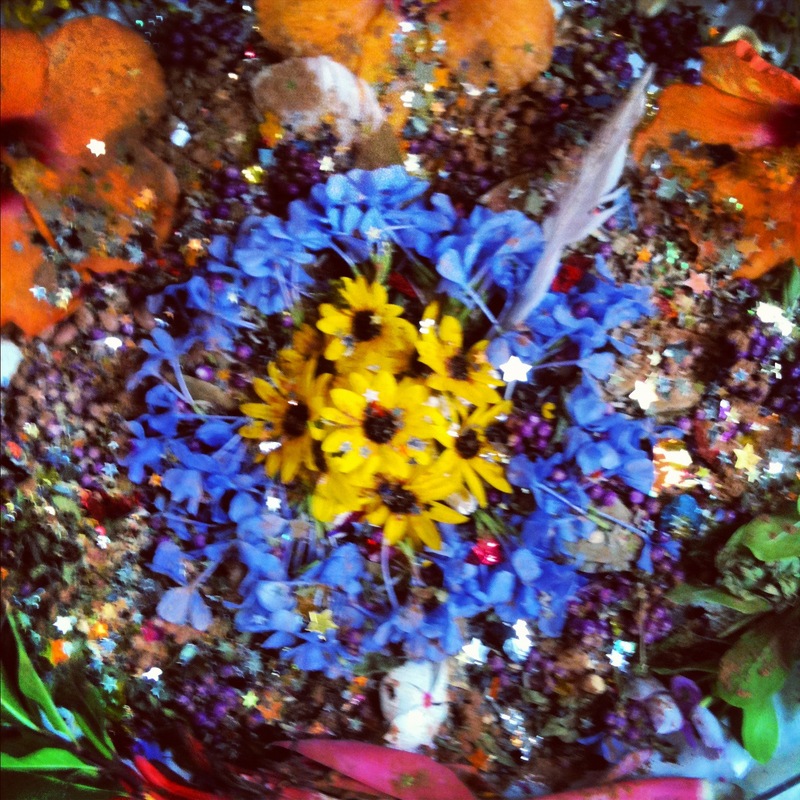 Flowers, tobacco, sage, lavender, sugar, cocoa, glitter, sparkles. A feast prepared as a gift to Spirit. The Heart is full of Beauty and Love. Our Forgotten Prayer Holder tied to the outside. Prayers held beyond time and space. our despacho sits with my mesa before the fire. Offering ceremony through the internet transcends previous boundaries, forms and ways of participating. We have an opportunity to connect from all over the world. It is a reflection of the magical and mysterious matrix of which we are all part. I honor and give thanks to each Soul that is called to offer prayers and intentions here to uplift the whole. As we gather under the darkness of Mama Killa, Grandmother Moon, we open our hearts to give thanks for the bounty of Pachamama and receive the gifts of vision. 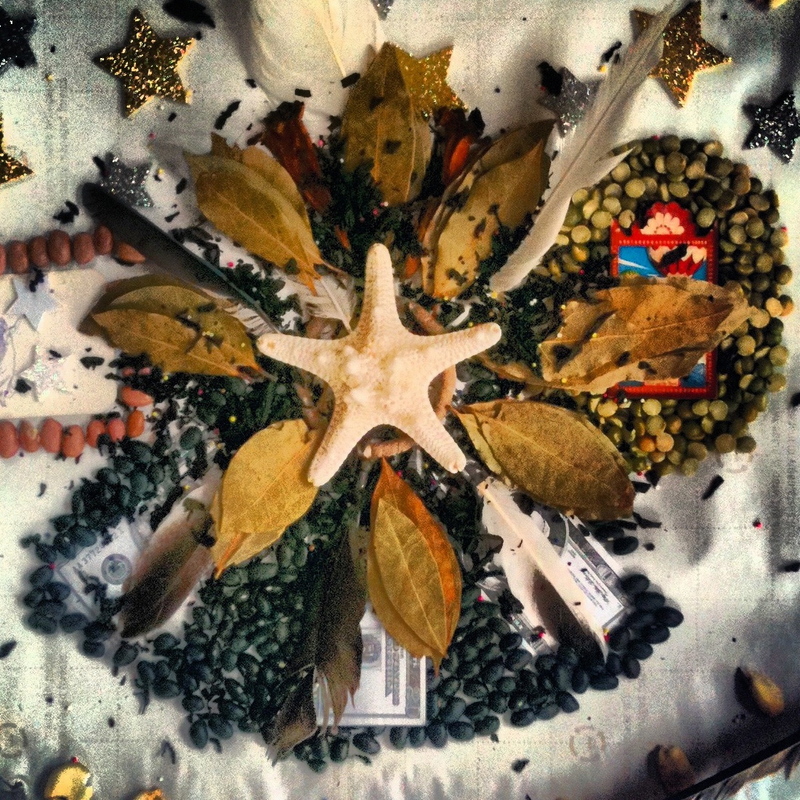 This month’s intention for our New Moon Despacho is inspired by the Pachamama Days of Peru. 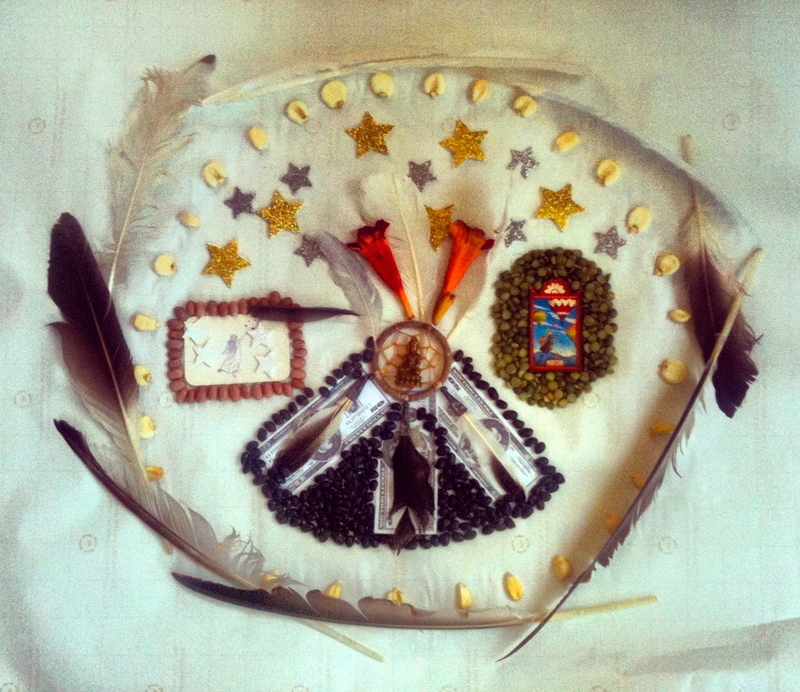 The shamans of the high Andes dedicate the month of August to honoring Pachamama and dreaming the world into being for the year ahead through the despacho ceremony. This ceremony weaves us to powerful visionaries and links our prayers to the collective intent of the paqos, the shaman priests. When we strip our hearts naked and taste its longing we discover our personal prayers are a call to humanity, a prayer of the collective. The essence of every heart longs to be in union with Spirit, to know the song of its Soul and express that for the good of all while we are here, in this kaypacha, the Earth plane. Our individual prayers become prayers for the collective. My prayers empower your prayers. We uplift each other. This is the meeting ground of ceremony. We offer our collective hearts to Spirit. will manifest in the kaypacha. We cultivate trust in the divine order. and old paradigms that have laid false imprints in our minds. that is so willingly offered to us. If you would like to add your prayers and intentions to this New Moon Visioning Despacho create a time and space that feels sacred for you. You will need about 20 minutes to follow this ceremonial video. We start with a short purification ritual followed by a journey of your heart to the year ahead. You are then guided on how to offer your prayers and intent to the qintu (a prayer holder that is placed in the despacho). I suggest viewing on full screen by clicking arrows at bottom right corner of video. 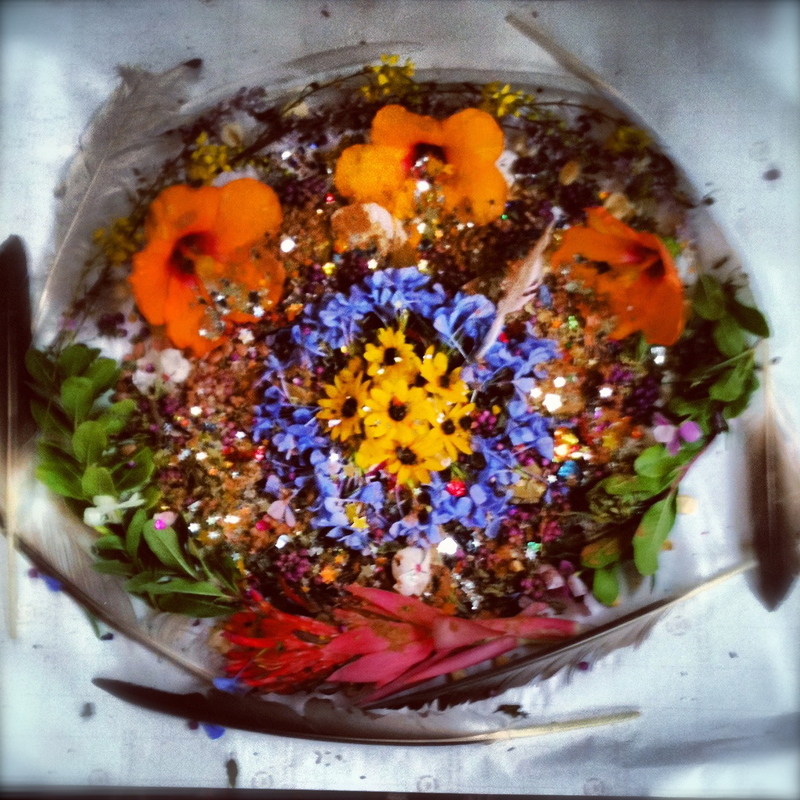 Create a Sand/Earth painting – gather natural elements such as sticks, stones, flowers. Let these reflect different aspects of your vision. Create a border for your mandala on the Earth and arrange these elements in a meaningful pattern for you. This would be beautiful to anchor in your garden if you have one. Create an Altar for your Visions – dedicate a space with a small cloth or textile and place any objects that symbolize your vision. Feed your altar by lighting a candle, leaving offerings or spending some time in meditation there. An altar will help hold and carry your visions to the year ahead. Express your Creativity – journal about what you feel in your heart or your dreams. Paint, draw or create a collage or vision board of your experience. The artistic expression integrates the experience more deeply into your Soul. of each and every heart. 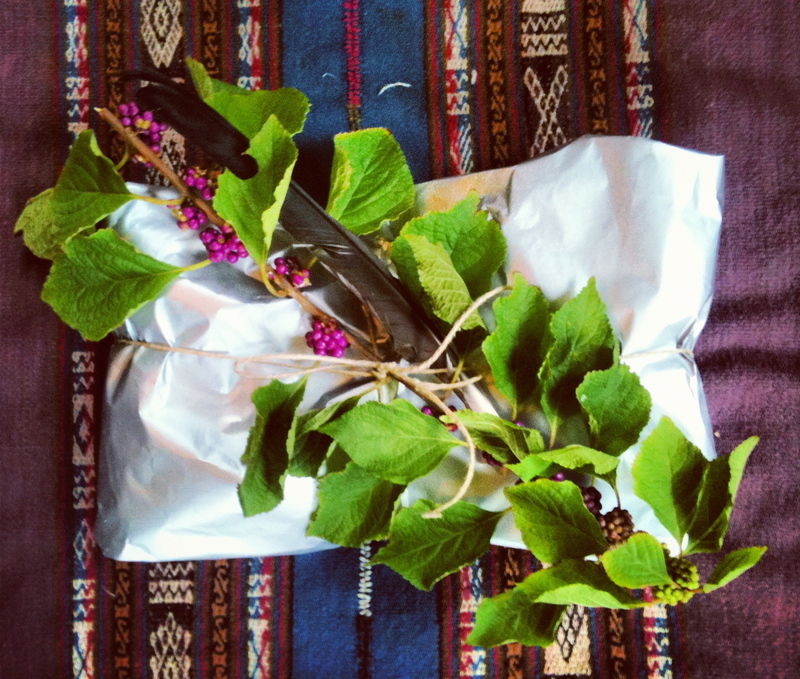 A mesa is a medicine bundle often referred to as a shaman’s altar used for healing, ceremony, prayer and divination. 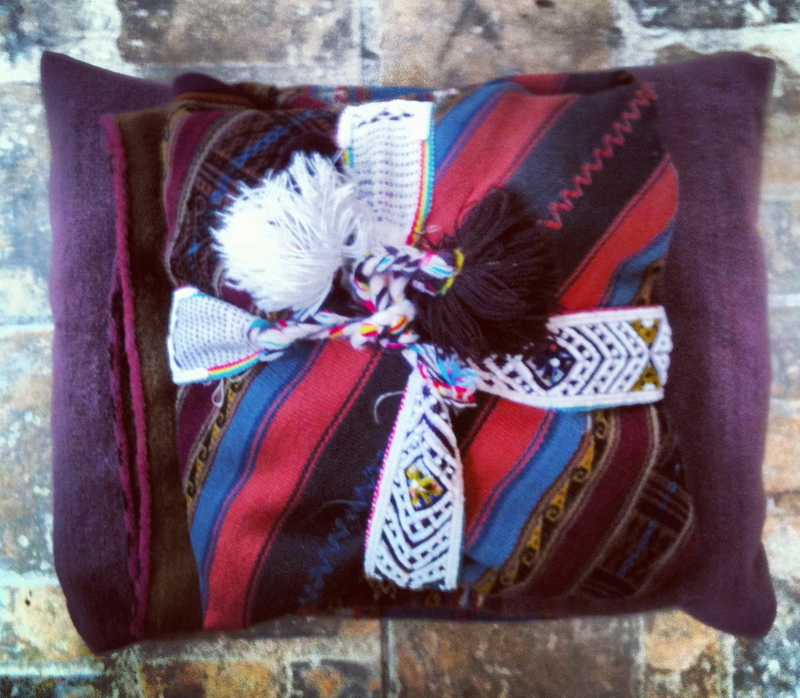 Sacred objects are wrapped within the mestana, a woven cloth, the most powerful of which are kuyas. Kuyas are stones received through rites, initiations and passages of healing. I first began building my mesa with Alberto Villoldo’s Healing the Light Body School. Since traveling to Peru my mesa has transformed and currently holds kuyas gifted through the karpays and initiations from shamans of the high Andes as well as Pachamama herself. My heart is moving through many shifts as it heals and integrates through this compelling time of life transition. I turn to my mesa to speak to the wholeness of the heart. The kuya that came forward was received on my last journey to Peru gifted by Don Andreas from the holy mountain Ausangate. I read the stone by blowing in with my breath the intention of the reading. Holding the stone I begin to notice marks, shapes, images, textures. These impressions from the literal level of perception lead to a mythic understanding and awareness. 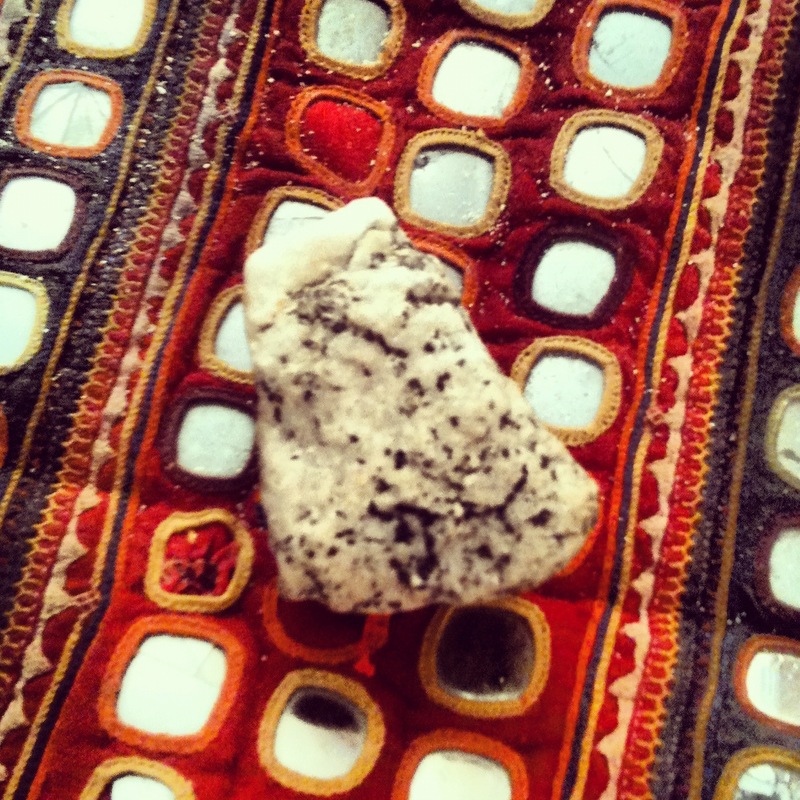 What I notice in one reading is completely different than what I may notice in another reading with the very same stone. This particular kuya is four sided. At the top of each side of the stone is a white peak resembling a mountaintop. Below the white mountaintop on one side of the stone is a gray and mottled pattern of dark spots in all different shapes and sizes letting us know the wholeness of our heart is held in all our experiences including the darkness. The journey to the mountain top is not straight and narrow as noted by the mottled pattern. Everything that happens to us as we journey toward the peaks of consciousness is necessary for our awakening. Once we respect and honor the journey as integral to our awakening we begin to drop the destination and recognize it is all part of our own evolution. Another side of the kuya reveals many, many faces woven together below the white mountain peak. The faces of our ancestors. We do not stand alone as our ancestors are intimately woven into our journey. They are longing for our connection. Part of our journey includes making peace with our ancestors as they long to make peace with us as well. Anger or sorrows that bind us to our past hampers our own evolution. It is difficult to move forward carrying the weight of what has come before us. The ascension to the mountaintop of consciousness is part of the whole. The whole is not the ascension. It is easy to place all of our desires on the mountaintop and lose sight of the journey but the mountaintop is just a part of the whole. It is not the whole. All journeys have rough spots and edges. Let us remember to be tender. No one is given a smooth path to travel. The more we can bring a tenderness to our own journey the more we can respect with tenderness the journey of every other soul. This is what the kuya speaks.